Strike Fighter Squadron 154 (VFA-154), also known as the 'Black Knights', is a United States Navy strike fighter squadron stationed at Naval Air Station Lemoore. The Black Knights are an operational fleet squadron flying the F/A-18F Super Hornet. As of 2014, VFA-154 is attached to Carrier Air Wing Eleven (CVW-11) and deployed aboard the aircraft carrier USS Nimitz (CVN-68). Their callsign is 'Knight'. The roots of VFA-154 can be traced back to VBF-718, a Naval Air Reserve squadron which was established at NAS New York, on 1 July 1946. The squadron was redesignated VF-68A, on 1 February 1947, VF-837 on 1 December 1949, VF-154 on 4 February 1953 and, finally, VFA-154 on 1 October 2003. 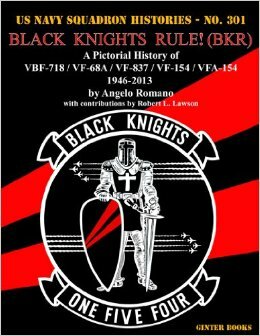 Steve Ginter’s Books has just released an outstanding in-depth history of the Black Knights written by renowned naval aviation historian, Angelo Romano, with contributions by icon photographer and former Editor-In-Chief and Founder of The Hook Magazine, Robert L. Lawson. The roots of VFA-154 can be traced back to VBF-718, a Naval Air Reserve squadron which was established at NAS New York, on July 1, 1946. The squadron was redesignated VF-68A, on February 1, 1947, VF-837 on December 1, 1949, VF-154 on February 1, 1953 and, finally, VFA-154 on October 1, 2003.